People young and old find courage when needed. Here are two books that show stories of courage. 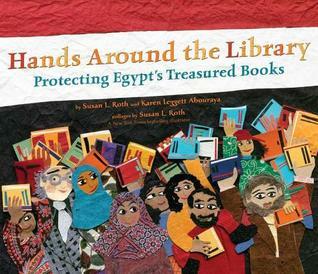 Hands Around The Library tells an inspiring true story of demonstrators standing up for the love of a library. In January 2011, during the unrest on a Friday when thousands were demonstrating for better lives, this moment captured the hearts of people all over the world. When there was a threat of vandalism, thousands of Egypt's students, library workers, and demonstrators surrounded the great Library of Alexandria and joined hands, forming a human chain to protect the building. They chanted "We love you, Egypt!" as they stood together for the freedom the library represented. Some of these in the group were NOT friends, yet that love for this building that housed BOOKS was something they all agreed to cherish, and protect. There are real photos of the human chain at the back, along with added information and sources. Susan L. Roth's stunning collages bring this story to vivid life. 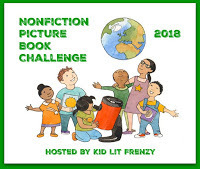 The book will be a wonderful addition to classrooms and/or school libraries. 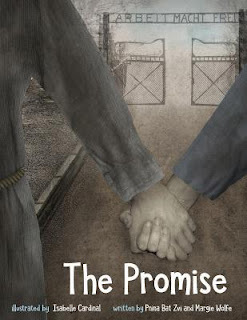 The Promise shares both a heartbreaking story when one sees how people, this time children, were treated in the concentration camps, but it’s also a heartwarming true story of how one promise to stay together was made by two sisters and carried out in the face of terrible danger. Before their parents were taken away, they gave the eldest, Toby, three gold coins hidden in a shoe paste tin. And, they asked them to promise to stay together always. In Auschwitz, those who fell ill and could not stand for roll call were often taken away, never seen again. This time, when Rachel became sick and was taken, Toby did what she knew she had to do, she used those coins to bribe a guard in order to enter the sick barracks and find Rachel. It also includes a small part about others who were with these two. The story is based on a true story, written by Pnina Bat Zvi, Rachel’s daughter and Margie Wolfe, Toby’s daughter. There is powerful truth in the illustrations by Isabelle Cardinal, who uses human faces in her digital collages. It’s a book for older kids, one that can be part of any study of the Holocaust. There is further information in the backmatter. 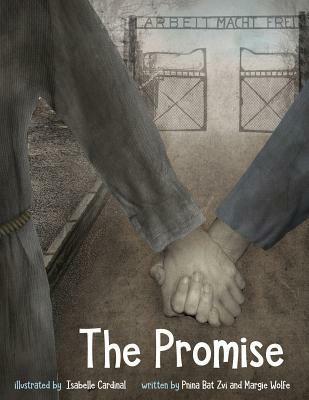 Kristen Picone shared The Promise title with me. I haven't found it yet, but it sounds like one I really want to read! Of course, the library title sounds like a good one to get! Both are worth a look, Michele. I've been reading more history about the death camps & The Promise is heartbreaking like so much of that time, but a lovely story of what love can do, too. Thanks! Wow! Both these books look fascinating! Neither is in my local library system, but I am going to request my library get them. Thanks for sharing. Good for you! I hope you enjoy them when you find them! Thanks!